Marlies are good enough to win without their star William Nylander, or Josh Leivo. But some other familiar faces are back and helped the team stay perfect in the shootout. 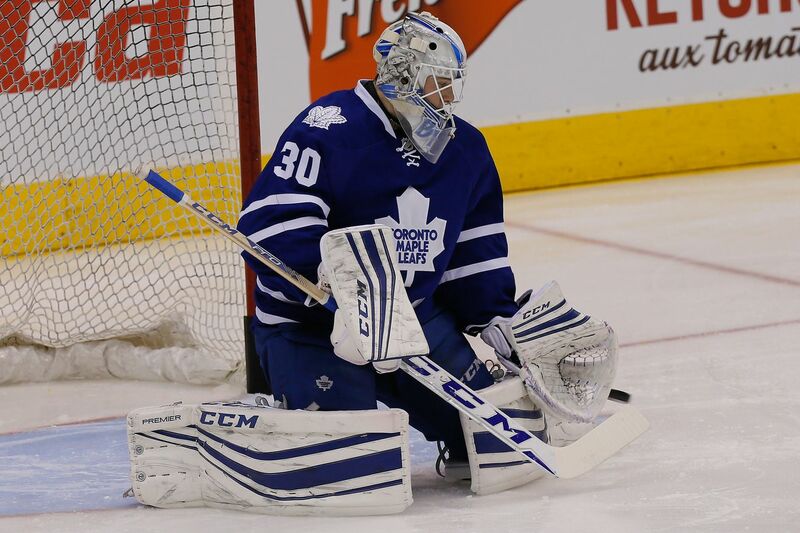 Also back on the Marlies is the now healthy Garret Sparks, who sat in backup to Antoine Bibeau. This left Ray Emery a healthy scratch, and it will be interesting to watch the Leafs and see how long they keep him on his PTO as insurance against more goalie injuries. And of course, no lineup shuffle would be complete without Mark Arcobello switching teams. With Byron Froese healthy, he’s back on the farm. The Marlies are a very good team, there is no question of that, and the way they’ve played without a bunch of their top guys has proven it. But if Andrew Campbell having a career year in scoring isn’t enough of a clue that there’s some luck at play, this PDO chart of the AHL should prove it. 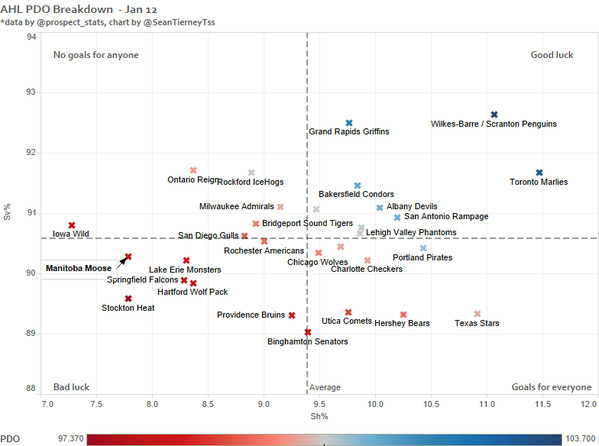 The Marlies have had very good goaltending, but they also have the highest shooting percentage in the AHL. This is the creation of Sean Tierney and he’s worth a follow if you’re interested in AHL, NHL or NWHL stats. The Marlies played a rare low shooting game–for them. The Comets had 37 shots to the Marlies’ 22. They started out well with Arcobello back as the top centre, Kasperi Kapanen back as his winger, and Jeremy Morin filling out the other side. Morin knows Arcobello from the bronze medal winning USA team at the 2015 IIHF World Championships. Arcobello impressed in that event, but Morin, playing down the lineup, did not. Nikita Soshnikov opened the scoring for the Marlies with an unassisted beauty of a goal where he plucked the puck out of the air and took off with it. The Comets tied it up at the last minute on a power play goal after the Marlies had taken two somewhat foolish penalties in a row. Ryan Rupert got the lead in the second. He was promoted up to second line centre with Brendan Leipsic and Matt Frattin, and he really stepped up. His 3 shots on goal were second only to Morin’s 4. Utica tied it up again midway through the third, and the Marlies finally poured on the high-octane offence they are known for. When they are going all out to score, the result is fast and furious and results in the occasional heart in the throat moment as the other team grabs a breakaway or an odd-man rush. Antoine Bibeau saw more of those than he likely wanted to in his first game since January 3, but he’s been looking at NHL players coming at him in practice while he was sitting in backup for the Leafs; he was very up to this task and was the player of the game for the Marlies. Overtime didn’t decide it, and the Marlies weren’t fantastic at 3-on-3, but they were flawless in the shootout again. The Utica broadcasters mentioned that the Marlies have not given up a single goal on the shootout all year. The Comets nearly broke that streak on their last try–Bibeau was beat and out of position, but Curtis Valk managed only to put himself in the net, the puck went wide. Soshnikov had the goal for the Marlies as the first shooter, and he was very good all game as was his centre, Frederik Gautier. The depth is showing itself very well on this team as they move up to fill the void left by the injury to William Nylander and the loss of Josh Leivo to the Leafs. Kapanen looked fast and full of energy for his first game back, and his line funnelled all their shooting through Jeremy Morin. That’s not a terrible thing to have happen, but if they stick together as a line, I would hope to see more shots from Kapanen and Arcobello. They have a lot of potential as complimentary parts. Check out Soshnikov’s goal in regulation. It doesn’t quite show him plucking the puck out of the air in the neutral zone, but the goal is lovely on it’s own. Sorry for the quality of the footage. Josh Leivo: Come on up!